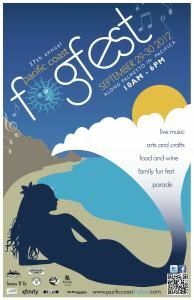 The Fog Fest is a 2-day-fun-filled event, that celebrates the sun, sand and surf. This year, Fog Fest features, actor/comedian, Rob Schneider, as their parade's Grand Marshal. Also featured, is the celebration of 30 years of their Family Fun Fest, which promises to deliver extra surprises! And, 12 year old rock band, Haunted by Heros, who are making waves everywhere, will be performing! Other highlights include a Sunday morning Fog Jog; winners of our photo contest, with a category for festival attendees to vote on; our famous Fog Cutter libation, but you must be 21 to try this one; over 100 arts & craft booths; listen and dance as we present 2 days & 3 stages of live music and the food and drink, lots of it, to satisfy any taste! The Fog Fest is proud to give back to its community organizations that participate, and also to the, "Gift to Pacifica Fund." Fog Fest also strives to lessen our environmental footprint by moving towards zero waste. This year a bike valet will be available. So, we encourage you to ride a bike with family & friends, and we'll take care of the rest! What's not to like?? See you there!